Letting your winners run is a topic which polarizes traders. There are those that swing for consistency and trade with strict profit targets. These are the traders who likely view letting your winners run as a sure fire way to lose your focus and open yourself up for more risks. Then there are those traders that think in terms of not worrying to much about any one trade, but has an understanding that over a longer period of time, you only need a few winning trades to make you profitable each year. Before you move read any further in this article, you need to honestly answer the question of which trader are you? If you are the trader that likes to trade based on strict profit targets (i.e. up 8%) then letting your winners run will never work for you. The pain of allowing a winning trade to reverse on you will be too traumatizing and will result in you constantly breaking your rules or worst, analysis paralysis. Now if you are the other trader, that only reacts to what the market presents you, I am going to clearly articulate how you can let your winners run. You will see there is no magic formula or silver bullet, but it’s more about looking at the market through a slightly different lens. This view of the market will require you to incorporate a number of key concepts, some of which are subjective in nature, in order to make the big gains. Tip #6 - Were you Ever Down on the Position? A winning attitude is a must in life if you plan on having any sort of success. If you don’t believe in yourself, then who else will? For some reason, traders have fooled themselves into thinking that successful trading only boils down to the latest algorithm or technical indicator. This couldn’t be the furthest thing from the truth. When you are trading, you may forget that there are human beings on the other end of the buy or sell transaction. This is a head-to-head competition to see who is right – the bulls or the bears. Part of the game of trading is not revealing your hand. The smart money will constantly force sharp moves up or down in order to throw off the little guy before the big move. 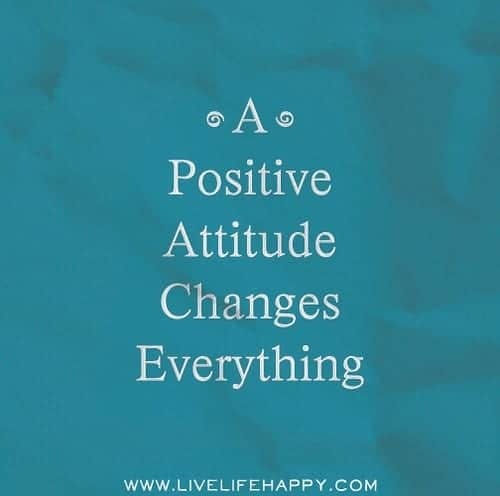 You are probably asking yourself, “What does a positive attitude have to do with any of this”. While everyone may have stop loss orders, technical indicators, charts, access to news, etc. there are some traders who are able to translate all of this information into successful trading, a.k.a money. This success factor my friend begins and ends with a winning attitude. Think about it, when you see your stock have a short hiccup in a current uptrend, is your first reaction to sell to lock in your profits? Or do you move your stop up so quickly that you are basically begging the market maker to trigger your order? The winning trader will see the same price movement as you; however, he or she will not interpret this information negatively. They will see a slight pullback in an uptrend as healthy price action and will comfortably watch the chart move without a negative emotion in their body. Their ability to sit through these corrections does not mean they have a lack of money management principles, it just means they believe the market will go in their favor as long as the correction or counter moves do not damage the overall trend. Do you have a winning attitude when trading or are you thinking the market is out to get you? If you feel in your heart you lack a winning attitude, I’m telling you right now that you will not be able to let your winners run. You will find some reason to sabotage the trade before you are able to reap the rewards of a well-planned trading strategy. 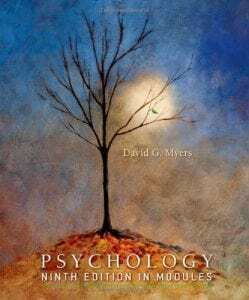 Earlier in my trading career I would constantly read about how you must reverse the concept of how your brain processes winning and losing trades in order to become a successful trader. I remember trying such techniques as looking at my winning trades and saying to myself, stay calm. Or I would say things like, “don’t focus on the money, focus on the chart”. I of course would end up checking my account balance obsessively and the weight of the profits would force me to close out the position. Early on I had such a hard time making money in the market, that the idea of giving back a decent gain was unfathomable. Conversely, when I was down on a position, it would not only affect my bank account, but also my mood. I felt like I was being water tortured as I watched what appeared to be a good setup deteriorate right before my eyes. These negative emotions of being in a position will wear on you the more you watch the position drift away from your entry price in the wrong direction. You have to grow accustomed to thinking in terms of probability. The first thing you need to do is identify your average number of winners and losers. If you don’t know that number, this is probably part of your issue. Let’s say on average you win 50% of the time. If you have this figured fixed in your head, you will go into each trade knowing you have a 50/50 shot. Now while you always aim to improve your win ratio, this will be your baseline. How do you think knowing you have a 50/50 shot of putting on a winning trade will impact your view when a trade goes against you? Right, it will make the fact the trade is not working out feel insignificant. You will no longer be shocked that your trade wasn’t an instant success. Let me caveat this section of the article, before I move on. Thinking in terms of probabilities helps you realize that every trade will not be a homerun and that you must have realistic expectations in terms of win ratios and potential profit gain. Thinking in this mindset will help prevent you from constantly looking for the next hot indicator which will magically make you profitable on every trade. What you should not do is go into each trade with a losing attitude. Meaning you say to yourself, “well here goes another trade where I only have a 50% chance of winning. Let me just put this trade on and close my eyes”. Wrong! You place the trade without any fear or reservation and over time you will improve as you learn what makes you tick. As you are tracking your performance, you will notice that this win ratio will continue to improve and what was once 50% probability will start to improve over time. In the spirit of thinking of probabilities, you have to realize that the market is completely unique in every since of the word. How the market or stock reacted to a news event last week will change this week. The key thing is getting into the position with no real expectation of how far things can run. You have to let go of the idea that you will outsmart the market and begin to predict her every move. Trading is about reacting to the opportunities the market presents to you on a daily basis and not trying to dictate how she should perform. This is a difficult concept to grasp, because there are so many studies out there like P&F or Elliott Wave which have predictive modeling tools. These tools like most indicators want to give you an indication of when a market is oversold or overbought. You have to remember that these are just signs. The same way you approach a red light, this is an indication to you to stop your car. Well with the market, it will see the red light but it will decide whether it will stop or not on its own. You have to realize you are not dealing with a logical entity. The market will go and do as she pleases. You have to be prepared that while you may see a red light ahead for the market, she may decide she wants to press on and reach new heights. Just remember it’s not your job to take the lead, but rather you should focus on being a passenger in the car. What is your exit strategy for closing a winning position? As you answer this question, think about if your exit strategy permits a stock to run wildly in your favor. In the past I have used the price closing above or below a simple moving average (<10 periods) as a basis for exiting my position. I would say to myself, I am going to let the stock run as far as it wants to as long as it stays above the 10-period SMA. Well, sure enough every once in a while this would happen. The problem was the stock would get so far away from the average, I would become obsessed with the idea of giving back too much profit, so I would talk myself into selling on the first correction. If you are honest with yourself, this sort of thinking is probably going on in your trading right now. 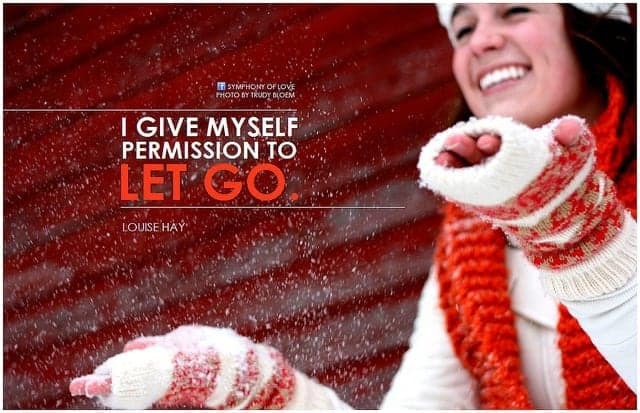 You must learn to let go, think in terms of probability and stick to your exit strategy. Reason being, while the stock may erase some of your gains on a sharp correction, you only need 2 or 3 swing trades a year to go in your favor to reap significant gains for the years. It’s great to have a winning attitude as we mentioned earlier, but it is also just as important to be up in your account. If you are day trading, this could mean being up for the day or month. If you are swing trading, this could mean you are up for the quarter or year. Whatever timeframe you are using it doesn’t matter. The point is you should feel a sense that the wind is to your back. Being in this position will make you relax as the stock goes through the wild back and forth swings towards your end target. If you are up in your account, you will not feel the need to take profits on the first retracement. That need to be right or just get a win on the books will not burn at you. Feeling like you are up and having that winning attitude will allow you to reap larger rewards. Over the last 14 years of trading, one concept has remained constant no matter what timeframe or strategy I use. If I was never down on a position, not even for a second, I am likely in a homerun. This doesn’t mean it’s a guaranteed win, but these types of trades are exceptional. It means that you were able to interpret the exact time in which the market was ready to start a move. In these types of scenarios, the money will literally fall into your account as the stock heads in your desired direction. Go back and look at your trades. Where there any that you were never down on? How far did those stocks run? How much of the move were you able to capture? When trading, do you think about how much you are wagering on each position? 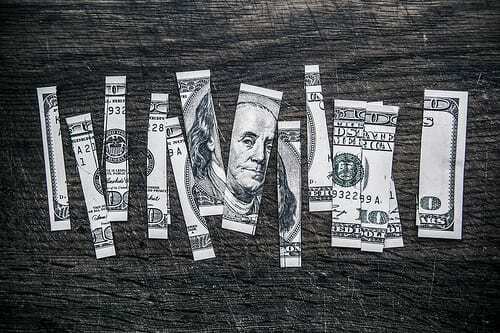 Have you begun to recognize how the amount of money you are using affects your trading? Most traders are in what I call the growth phase. You have a small account, probably less than $100,000 and are looking to make big money. The idea of steady growth over a 5-7 year span in order to get to the big money $500k+ seems too long. Instead of taking calculated risks, where you look to make consistent gains and let time work in your favor. You are likely to take riskier bets and wager large portions of your account on a single trade. This sort of approach may work in the short-term, but over time the market has a way of weeding out risky traders. On the other end of the transaction is the professional who never risks too much of their account and continuously takes money out of the market. Take a minute to think through your money management principles. Do you ever risk more than 50% of your account in one stock? Do you find yourself hoping that one trade can erase all of your losses for the year? Having heavily concentrated positions will not allow you to let your winners run, because you will likely be a nervous wreck. Since stocks rarely go in our favor immediately, you may experience a significant drawdown in your account, especially if you are using margin. How do you think you will react the second the stock goes in your favor? That’s right, you will look to close the position. Not because you are wrong, but because you did not manage the risk properly, so you were never comfortable in the trade to begin with. Without a certain level of confidence, the smart money will be able to shake you out of your position with any minor intraday correction and prevent you from riding the large wave. Now that we have covered these topics in the abstract, let me give you my formula for letting winners run. A few weeks ago I was in 2 losing positions, FIVE and NTRI. Both of these stocks were down close to 10% during the sharp market correction that took place from late January through early February. Just a few years ago, this sort of draw down would have rattled my cage, because I would have probably been using 150% margin and would have been sick to my stomach. However, for these trades I was only using cash and while it doesn’t feel great to be down on any position, I knew a market bounce was coming at which point I could evaluate these positions. So, here is a clear example where my money management principles allowed me to stay calm in the eye of a storm. Instead of focusing on the fact I was down on FIVE or NTRI, I noticed that RMTI was setting up nicely. Over the years I have grown to learn that each trade is unique, so at the end of the day there is nothing to fear but fear itself. So, I took a long position in RMTI at $10.17 on 2/5/2014. Immediately the stock went in my favor. Not by much, but she just continued to act in a positive fashion. Then the magic happened. 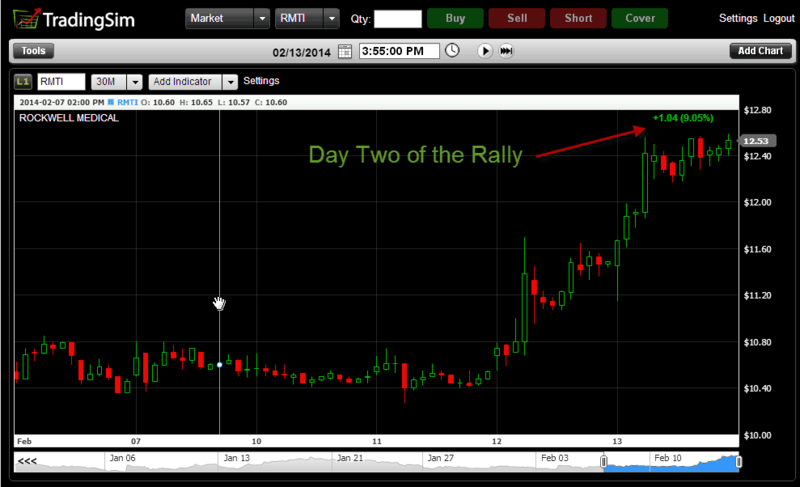 On 2/12/2014, RMTI started to rally and the stock finished up on the day approximately 9 percent. In the past I had a rule that if a stock gave me 10% I would just take the profits. For new traders, I do advise you to get in the habit of taking money out of the market, because this is essential to becoming a profitable trader. However, as your skills increase you must learn to let the winners run in order to make big gains by years end. Back to RMTI, on 2/13/2014 the stock rallied again another 8%. To sit through two consecutive days of almost double digit gains was unthinkable to me when I first started out trading. I would have said to myself, the stock just hit $12 dollars which is another big whole number, so things are likely to turn here. Or I would have seen the last swing high of $12.35 and used that as another reason to sell. On hold, things continue to get better. 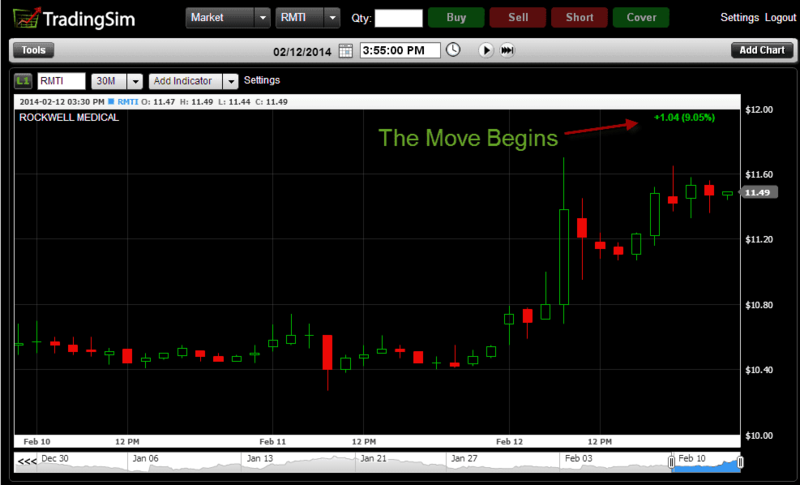 On Valentine’s Day, 2/14/2014, RMTI hit a high of $13.96. I closed my position out at an average price of 13.30 which represented an approximate 30% gain in less than two weeks. Can the stock go higher, of course. The difference is I don’t care because I followed my strategy and I was able to take money out of the market. How did I know to let RMTI Run? I was never down on RMTI. From the minute I entered the trade she went in my favor. That second one has a lot in there, so let me illustrate. 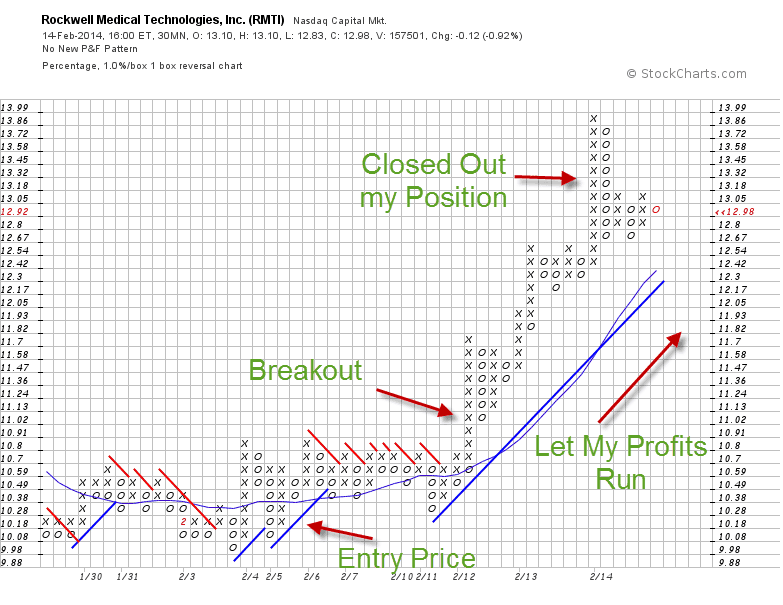 Below is the 30-minute P&F chart of RMTI courtesy of stockcharts. You may be asking yourself, well couldn’t the stock go higher? RMTI is still above its 15-period moving average and looks healthy. Of course! But for me a windfall profit is anything between 30% - 50% gain in a few days. What is your definition of a windfall profit? Only you can answer this question. But based on how volatile the stocks are that you trade, you know when you are leaving money or the table or if you are getting the lion share of a move. Only you can define what letting your winners run means to you. 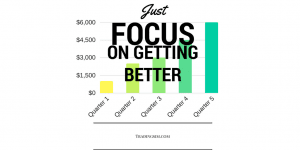 The key thing is that over time you should see your average gain per trade increase. There are too many factors that drive how far one individual trade may go in your favor; however, over the aggregate your average gain per trade should increase. The same way you gain strength and endurance from working out, these same rules apply to trading. As you gain confidence and learn to realize that you have a winner, you will learn to let go and take a ride in the passenger seat. So for now 30% - 50% on one trade feels right for me; however, in a year or two I may have to update this article to say 60% - 100% for every homerun play as I learn more and more to accept what the market is offering to me in the moment.